The curtain was brought down on another annual festival of cricket at one of the most scenic grounds in the country when Sussex took on Ireland in a T20 fixture for Ed Joyce’s testimonial on Sunday. That meeting followed Sussex’s crushing County Championship Division 2 triumph over Durham - a game in which they managed to win inside three days. Youth academy graduates Phil Salt (130) and Tom Haines (124) both smashed maiden first-class centuries as former Australian international Jason Gillespie’s side racked up 552. The massive total meant Sussex needed to bat only once, with Durham bowled out for 211 and 277 in response as they were beaten by an innings and 64 runs. Former Sussex skipper Joyce then pulled on a club jersey for the final time as Sussex lost by six wickets to Ireland in a T20 clash. More than 10,000 spectators came through the gates throughout the four days of action and Arundel Castle Cricket executive secretary James Rufey felt things could not have gone any better. He said: “It was great to have Sussex here again for what turned out to be another fantastic week. 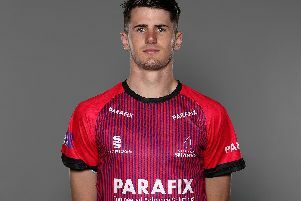 “There was some great cricket played, supporters came out in numbers, Sussex won and the weather was nice - we could not have asked much more than that. We had 10,000 through the gates for the three Championship days and Ed Joyce’s testimonial match. For Ed Joyce’s game we had around 1,500 in, which was pretty good going considering a small matter of a certain football match that was played on the same day. Maiden centurions Salt and Haines shared a record second-wicket stand of 244 against Durham to put Sussex on the way to victory. Haines. 19, reflected on a moment he will never forget and said: “It was an unbelievable day. I was in New Malden for a second team match the day before, I was in the hotel when I got the call at 9.30pm from Jason Gillespie. “I don’t drive so mum picked me up and drove me down to Arundel, so it was a busy morning. Arundel Castle officials were delighted with how everything went over the course of the week and the hope is Sussex will return again next year.